Young Gifted and Black: VIDEO- Janay Rice interview with Matt Lauer: "I know this isn't us and its not him"
VIDEO- Janay Rice interview with Matt Lauer: "I know this isn't us and its not him"
Mama always told me if a man puts his hands on you once, he will do it again. But every one has their own path to travel. Wish Janay Rice Peace and Happiness. 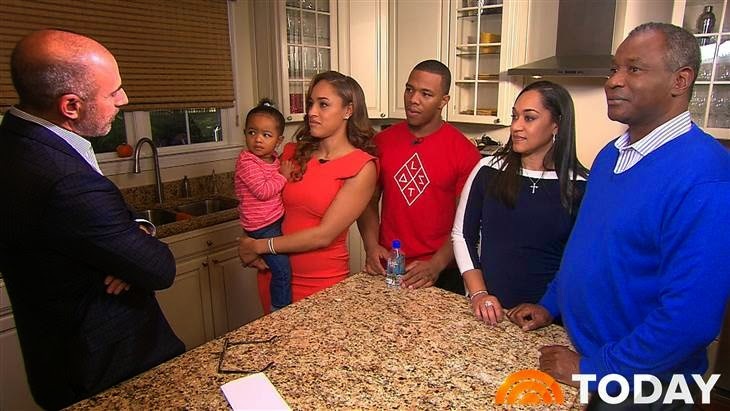 For the first time since former Baltimore Ravens running back Ray Rice was suspended indefinitely by the NFL for assault, he and his wife, Janay, are speaking out — joining Matt Lauer for exclusive interviews airing Monday and Tuesday on TODAY. After being knocked unconscious, Janay says her first reaction was to be “done” with the relationship. But Janay and Rice stayed together, getting married on March 28, just over a month after he was arrested and charged with third-degree aggravated assault for the attack. “Of course in the back of my mind and in my heart I knew that our relationship wouldn't be over because I know that this isn't us and it's not him,’’ Janay said of the elevator incident. On Friday, Rice successfully appealed the indefinite suspension handed down by the NFL in September following the release of surveillance video in which he was seen assaulting his then-fiancee. Rice had been requesting reinstatement to the league ever since his contract was terminated by the Ravens on Sept. 8. He is now eligible to sign with any NFL team.